From September 27-30, 2016, Hamburg will again become your gateway to the world of wind energy. The international trade fair, WindEnergy Hamburg, will provide a comprehensive overview of the current status and future prospects of the sector – along the entire value chain of the international wind industry, onshore and offshore. It will take place on the grounds of the Hamburg Messe exhibition center, and for the first time this year, the EWEA annual conference will also take place along side this trade fair. 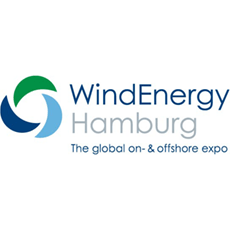 Scheduled to kick off right after SMM, the world's leading trade fair for the maritime industry, WindEnergy Hamburg offers excellent synergy effects for offshore providers. For the second time, in 2016, Hamburg will be the venue of the global trade fair for wind energy. Hamburg is a thriving business metropolis and major hub for the international wind energy sector. It is home to the leading companies in the sector and pools key competencies in both the onshore and offshore areas of business. With the European wind industry capital as its venue, WindEnergy Hamburg provices the perfect setting for you to present your company on a professional and international platform.